Sri Lanka is well known for its warm waters, mellow waves and beautiful beaches. From the end of October to the beginning of April, the Southwest coast lights up and becomes a mecca for surfers from all over the world. It’s not hard to see why when it holds bragging rights to some of the best surf spots in Sri Lanka. During these months, swells become more consistent and the trade winds turn offshore making conditions ideal for surfing. 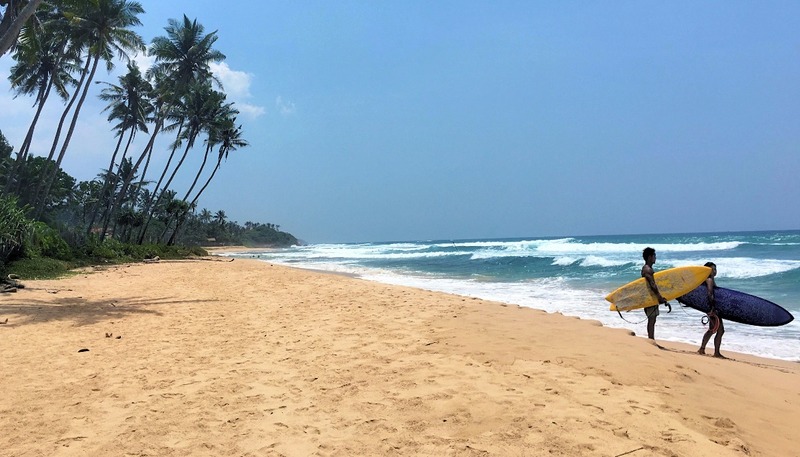 Many people surfing in Sri Lanka base themselves in the chilled village of Midigama as this location has no less than five good surf spots that consistently work, all within about 15 minutes walk of each other. This guide covers each of those spots, plus the best surf spots in either direction which can be easily accessed by tuk tuk or scooter. 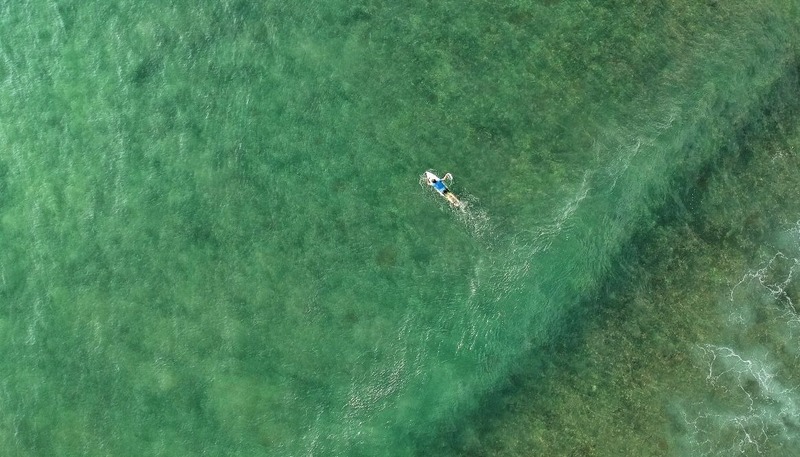 As Sri Lanka is not particularly affected by tidal variation, these spots can be surfed on all tides. A powerful wave offering up fast rights and sometimes hollow lefts, Coconuts can hold up to 6ft on a long period swell. Be aware of the reef as you near the beach. Paddle out from the same entry point as Plantations surf spot, through a break in the rocks along the shoreline, or paddle straight out over the reef in front of the break. This spot is usually less crowded than its neighbour, Plantations. Suitable for advanced intermediates and up. A deep, sand bottom reef break, Plantations produces fun peeling rights and depending on the swell direction, a nice left (watch out for the rocks). If the swell direction is coming straight into the beach, a second peak works on the inside and is usually less crowded than the main peak. As with Coconuts, be aware of the reef as you near the beach. The entry point and channel is from a break in the rocks that line the shore. Suitable for advanced beginners and up. After a steep, fast take-off, this popular A-frame provides short, fast lefts and barreling rights. Breaking over sharp, shallow reef, this spot holds up to 5-6ft on the right swell. Enter from the small beach in front of the break or go in straight from the rocks that line the shore. Suitable for advanced surfers only. This spot is one of the most popular and therefore most crowded in Midigama. Lazy Left, as the name suggests, produces long peeling lefts which mellow out after a steep take off. The waves break over deep reef making it a good introduction to reef surfing. This spot can hold up to about 5ft. Paddle out from the beach and aim for the channel between where the waves are breaking off Lazy Left and Lazy Right. This makes the paddle out much easier than it looks! Suitable for intermediates and up. Often overlooked in favour of Lazy Left, neighbouring Lazy Right offers mellow rights and lefts, and on the right swell conditions can produce long rides all the way back to the beach. Less experienced surfers will probably feel more comfortable surfing the peak on the inside. The waves break and reform so don’t be afraid to catch the wave just as it has broken and surf back onto the green face; the wave breaks gently on the inside and sometimes it’s the only way to take off! Paddle out from the beach in front of the break. Take care to time it right as this beach is a massive shore dump! Of all the breaks in the area, Lazy Right is the most susceptible to swell size and direction and doesn’t always work. A short tuk tuk or scooter ride in either direction will take you to numerous other breaks. Widely regarded as the best place in Sri Lanka to learn to surf, absolute beginners will be comfortable in sandy Weligama Bay. There is a slight cross-shore current but it’s not strong. More experienced surfers will also find something to get their stoke on with this spot holding up to 5ft. The peak in front of the Marriott Hotel tends to be the most consistent but a small wave for beginners may also be found in front of the island. This break can get very crowded in peak season and surfing at first light is a good option to avoid the crowds. Water quality is not as good as neighbouring spots, especially after heavy rain. Suitable for absolute beginners and up. 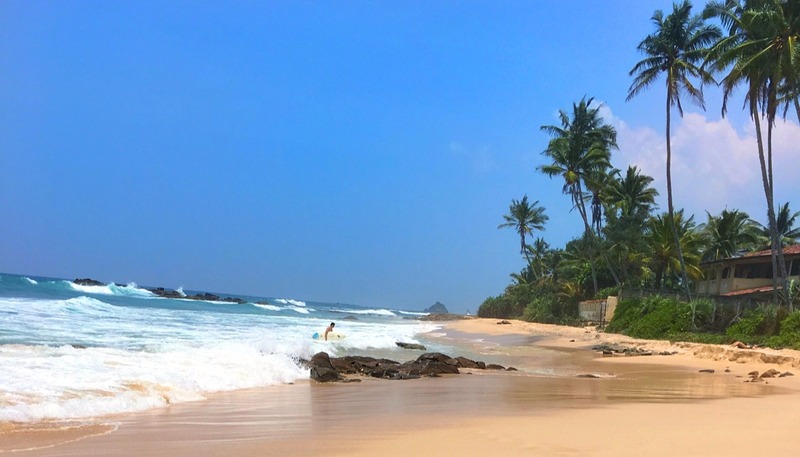 A good sheltered spot, and one to consider if you are surfing out of season, Mirissa is a picturesque reef break fringed by palm trees. A fun right hander can be found at the Western end of the beach and a left by the harbour. This spot holds up to 5-6ft. Expect to contend with crowds and watch out for urchins, this break is one of the worst for them! Suitable for intermediates and up though be aware that it can get quite shallow on low tide. Just West of Ahangama, this is lesser known and therefore less crowded spot, produces a nice peeling A-frame that can hold up to 5ft. On smaller swells it is a really fun longboarding wave. A sandy reef break, be aware that this spot can get quite shallow on the inside. As you leave Ahangama to the West you will see a restaurant and RDS Surf School on the lefthand side of the road. The stilt fishermen’s poles will confirm you have the right location. Paddle out from the steps that lead down over the rocks. A few minutes further West, a perfect A-frame breaks over sandy reef just in front of ‘The Rock’. 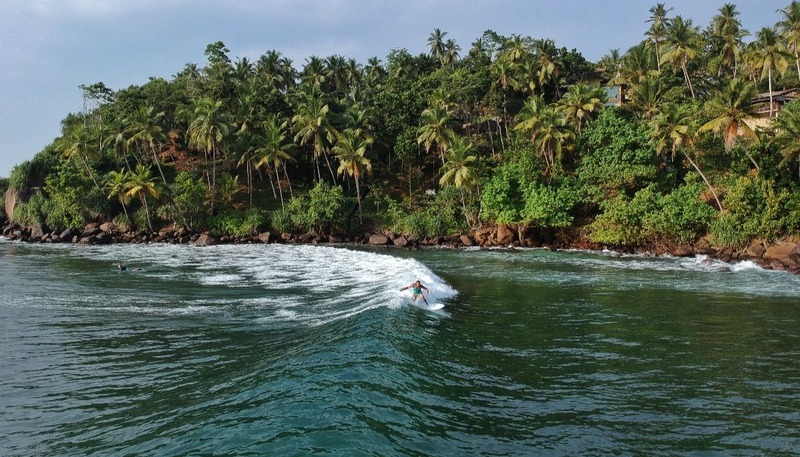 A powerful wave with a steep take off, this break is considered one of the best in Sri Lanka. Its quality is no secret though so expect to compete for waves with the masses during the main surfing season. To the left of the ‘The Rock’, Kabalana also has a powerful beach break. Depending on the swell it can be challenging with waves breaking heavily in pretty shallow water. 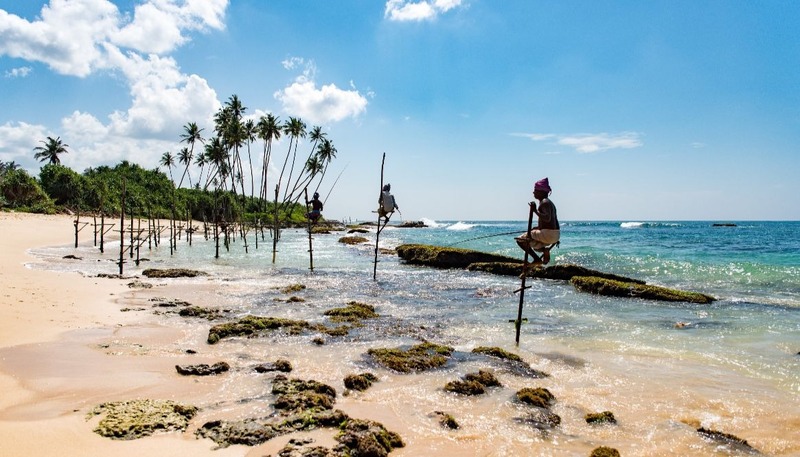 The beach is suitable for beginners but you will find stronger cross-shore currents than at Weligama. What’s your favourite Southwest Sri Lanka surf spot? Share your favourite Southwest Sri Lanka surf spots or any more tips in the comments below. If you have any questions, just leave a comment and I will do my best to answer them. 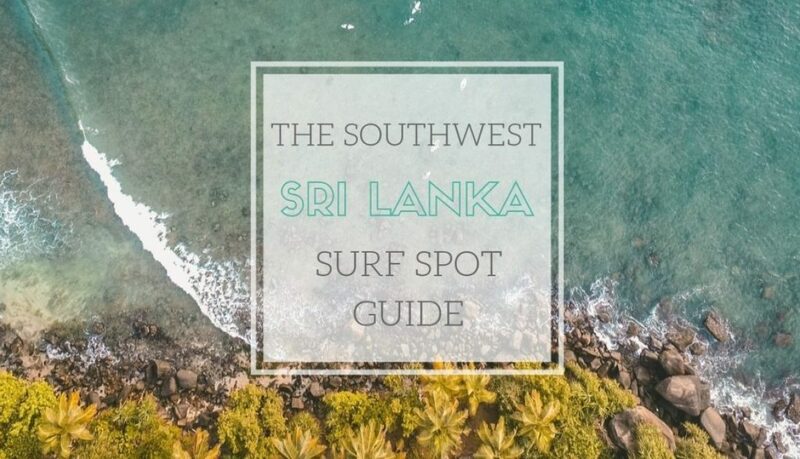 If you found this post helpful or if you know anyone who could use a guide to the Southwest Sri Lanka surf spots, it would be awesome if you’d share it using the social buttons below. 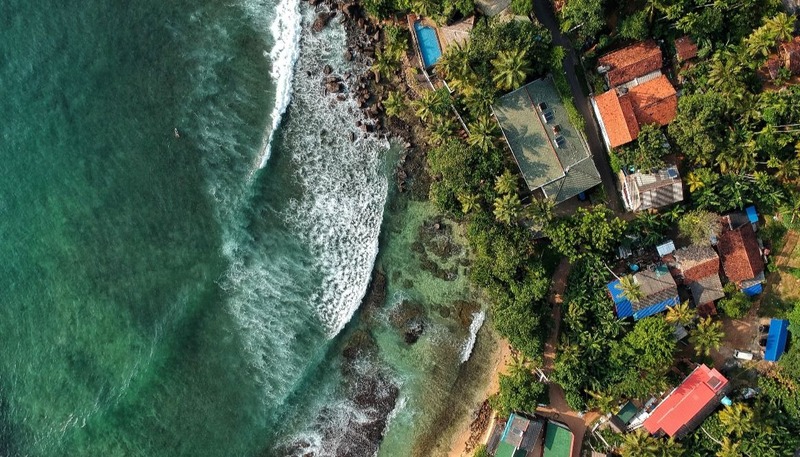 Whether you’re looking for the perfect location to base a surf trip in Sri Lanka, or just travelling around this beautiful country, it’s hard to beat the relaxed surf village of Midigama. 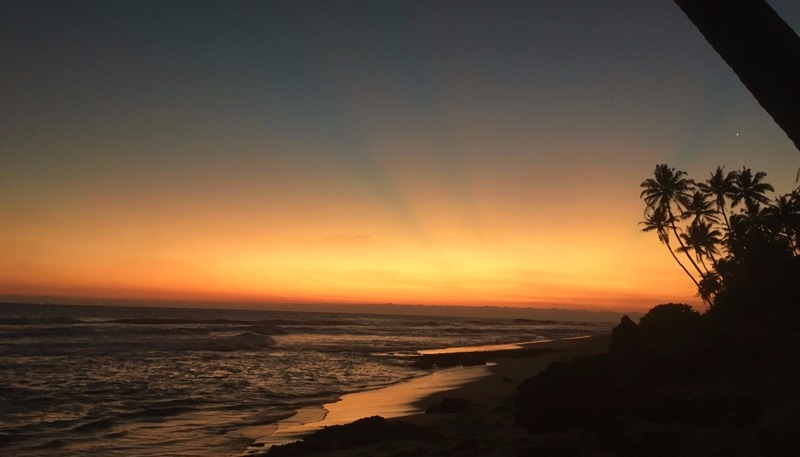 Lying 140km south of Colombo on the Southwest coast, Midigama boasts five consistent surf breaks within easy walking distance of each other, uncrowded picture perfect beaches, and loads of accommodation options right at the beach. 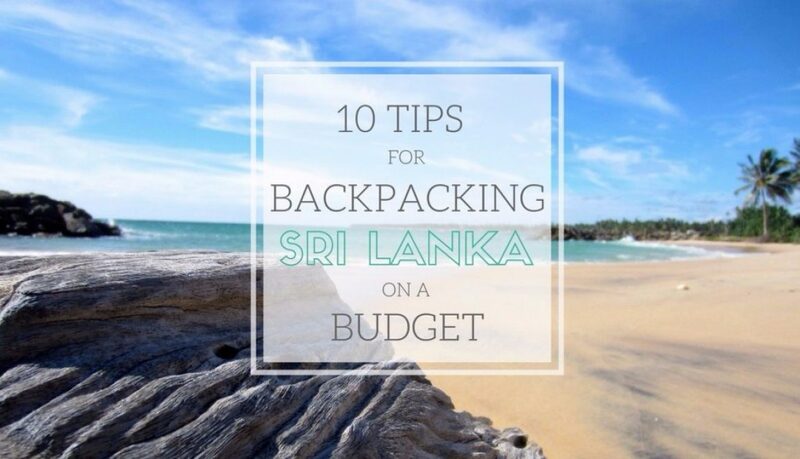 When I started travelling, I planned to spend a month surfing Sri Lanka in total. I started my trip in Midigama and ended up spending two and half months just there! The big draw of Midigama is that it doesn’t feel as touristy or chaotic as other towns on the Southwest coast. Its central location means that more surf spots can be found in both directions by tuk tuk or scooter, and it’s a great base for exploring the local area and sightseeing. 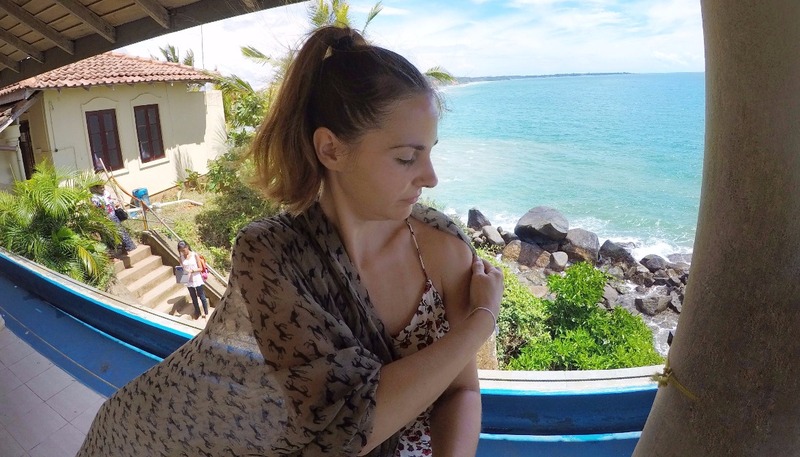 Whale watching, Galle Fort, and Handunugoda tea plantation are all less than a 45 minute drive away. You can also see masses of elephants at Udawalawe National Park which is about 2 and a half hours away by car and is an awesome half day trip. 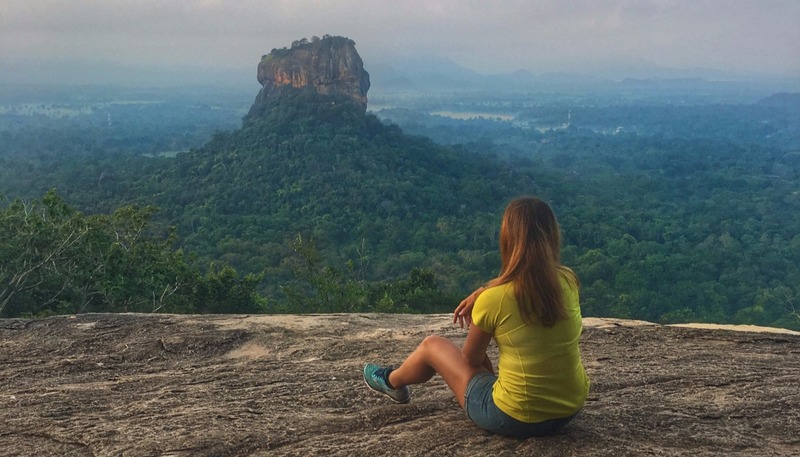 The best time to visit the Southwest coast of Sri Lanka is from the end of October to early April. During these months you can expect the majority of days to be dry and sunny and the conditions for surfing are ideal with consistent swell and offshore winds. The easiest option, especially if you are travelling with surfboards, is to pre-arrange a taxi. A pre-booked taxi to Midigama (including boards) should cost around Rs 8,000 (£42) one way, so use this as a guide when negotiating. The journey will take about 2 1/2 to 3 1/2 hours depending on traffic. Firstly you will need to get from the airport to Colombo Fort train station. 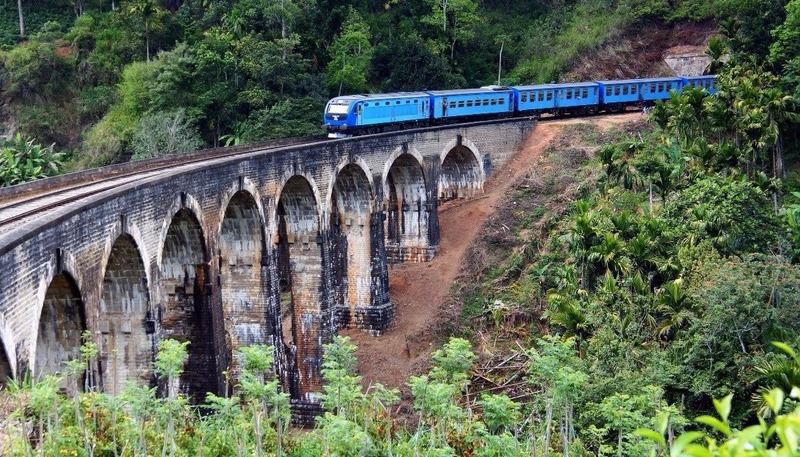 From there, you can take the scenic coastal line to Midigama or neighbouring Ahangama and Weligama. 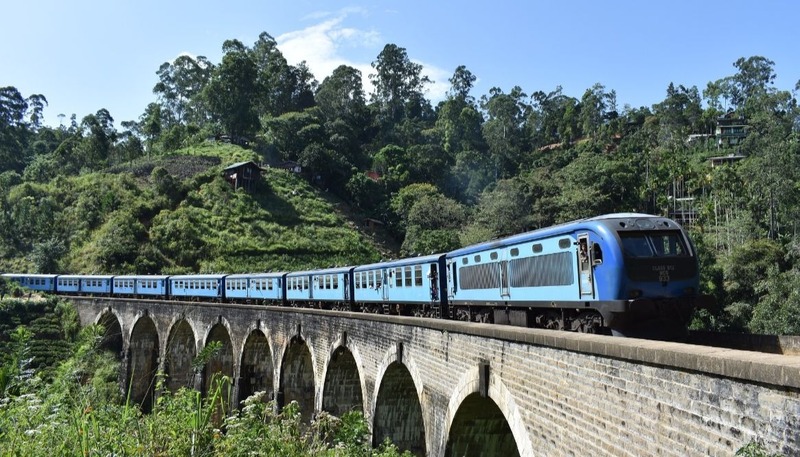 Trains to Ahangama and Weligama are more frequent so you may find that it is more convenient to stop there, then take a short tuk tuk ride to Midigama. A tuk tuk from Ahangama or Weligama should cost around Rs 300 (£1.60). The train journey to Midigama takes about 3 hours and costs Rs 220 (£1.15). Be aware that Galle station is a dead end so the train pulls in then changes direction to get back out. Don’t panic, you’re still going the right way! Also, Midigama station has a really short platform so if you are in the rear carriages you will need to walk through a few carriages to get off onto the platform. The cheapest way to get to Midigama is by bus. You can take a bus from the airport to Colombo and then take a bus from Pettah bus stand or Bastian Mawatha bus station. 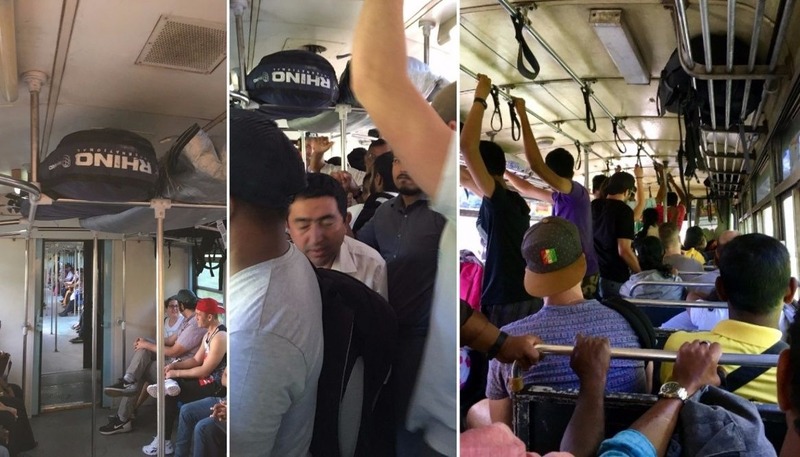 If you have a lot of luggage or a surfboard, the bus is not a practical option as they are usually packed or become packed as they go and luggage space is very limited. A backpack is ok but you’d definitely struggle with hardshell luggage. Thanks to its popularity with surfers, Midigama has loads of accommodation and options for a range of budgets. 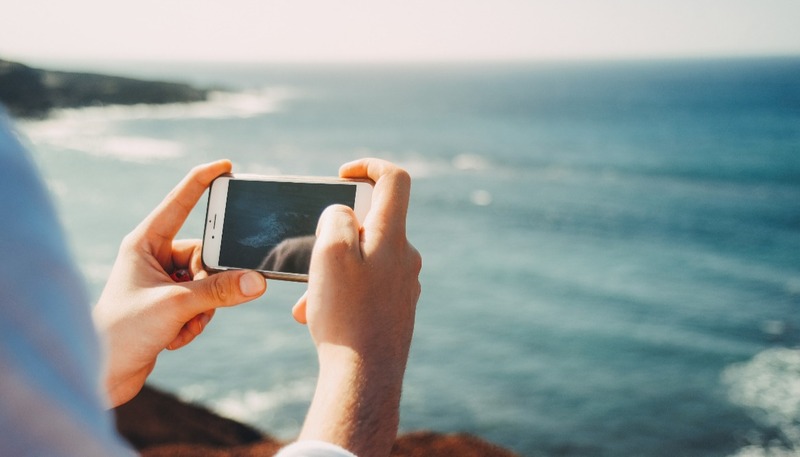 Booking.com and Airbnb cover the majority of places, but you will also find some gems that are not listed on any booking sites. The village of Midigama is essentially spread out along the main road that runs down the coast so finding somewhere close to the beach is easy. All of the options listed below are perfect for surfers. Situated right in the middle of Midigama, Ebb & Flow Jungalows bring the luxury touch to surf travel in Sri Lanka. Two villas in a private boutique setting offer air conditioning, a swimming pool, and a terrace with sea views. Their celebrated in-house chef will serve you breakfast and any other meals you require during your stay. Prices vary in the range of £255-£300 ($320-$375) a night for a two bedroom jungalow that can accommodate up to 6 people (additional charges apply above 4 people). 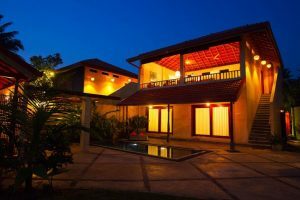 Located at the far Eastern end of Midigama, close to Coconuts and Plantations surf breaks, this place has 4 spacious rooms with 3 offering air conditioning. The two upstairs rooms have balconies with a sea view; perfect for checking the surf. The garden has a really nice chill out area and a lovely little cafe serving delicious Western treats. Prices vary in the range of £40-£60 ($50-$75) a night for a double room with ensuite bathroom and air conditioning. These cabanas are in a similar location to Plantation Surf Inn at the Eastern end of Midigama, but are set back further from the road in a peaceful, private garden. Each cabana has a small terrace and kitchenette with mini fridge. You can still enjoy great food and company by eating up in the main guesthouse. Prices are around £40 ($50) a night for a double room bungalow with ensuite bathroom. This super friendly and sociable guesthouse is located across the road from Plantations surf break, at the Eastern end of Midigama. Set back from the road in a tranquil garden which eliminates any noise from the road, this place is a nice mix of couples, families and friends and is ideal for solo travellers. The team here is fantastic. Chathu can advise you on, or arrange, everything you need from elephant safaris to getting married! The restaurant is particularly good. Prices vary in the range of £19-£24 ($24-$30) a night for a double room with ensuite bathroom, or a single room with separate bathroom is available for £13-£16 ($16-$20) a night. Located opposite Plantations surf break, this guesthouse has 4 rooms and is large, light, and airy. You can sit on the balcony with a beer or a coconut and watch stilt fisherman at work against the backdrop of crystal blue waves rolling in. There is no restaurant here but a basic kitchen with a fridge is available. This place is run by a wonderful family and is where I stayed for the majority of my time in Midigama. Prices vary in the range of £11-£13 a night. You may be able to negotiate a cheaper rate if you arrive without a booking and they are not fully booked. Slightly more inland and away from the noise of the road, this guesthouse is a favourite of longer term travellers. Each room has a small ensuite bathroom and there is a kitchen available to prepare food. Some of the rooms are a little dark but I think the budget price reflects this. Prices vary in the range of £10-11 a night, although if they are not fully booked, you may be able to turn up and negotiate a cheaper rate. Restaurants line the main road through Midigama offering a choice of local and Western food. The following are my favourites, and where I ate most often. Serving good food for breakfast, lunch and dinner, the menu at Plantation is a mix of local and Western food. Everything is cooked under the watchful eye of Chathu’s father who spent 24 years working as an executive chef at the five star Cinnamon Tree in Colombo and it shows. The food here is, in my opinion, the best you’ll get in Midigama. Each day the evening meal special changes so be sure to call in around 4pm to see what it is and book if you plan to eat there. Check out the BBQ on Wednesday for whole grilled fish, chicken and prawns. Prices reflect the quality so this is one of the more expensive places to eat in Midigama (though still cheap by Western standards). Rice and curry will cost around Rs 600 (£3.20) and the BBQ up to Rs 1,450 (£7.70). 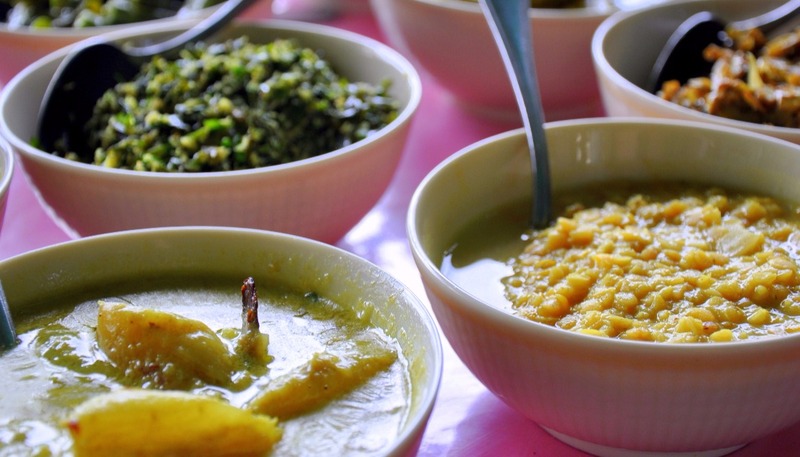 Try: The rice and curry here is among the best I had in Sri Lanka and there’s plenty of it! Book it in advance. Located in the middle of the village, Surf View has a platform with tables overlooking the sea and more tables in a small garden area. This place is super popular and it’s not uncommon to have to wait for a table, but it is definitely worth the wait. The menu is a mix of local and Middle Eastern food and every dish is delicious. Sit with an iced coffee and enjoy the sea view or watch the expert surfers tearing it up at Rams. Don’t come here if you’re in a hurry; speedy service hasn’t made its way to Sri Lanka yet and this place is no exception. Prices are in the budget to mid-range. Rice and curry will cost around Rs 250 (£1.30), Sabbich around Rs 500 (£2.65). Try: Sabbich; an Israeli wrap stuffed with humous, roasted vegetables and boiled egg. Shukshuka; poached eggs in a delicately flavoured tomato and onion sauce. Sweet coconut rotti; a super sweet rotti filled with shredded coconut and honey. Another popular place; waiting for a table is not uncommon but is testament to the food. Mama rules the roost and will get you sat down and eating as quickly as possible. Fried rice, noodles and kottu are the staples here and come in mountainous portions! The main attraction though is the rice and curry buffet. Rs 300 (£1.60) will buy you as much as you can eat of a selection of vegetable curries in varying degrees of spiciness plus rice and popadoms. Prices are budget to mid-range. Rice and curry is Rs 300 (£1.60), noodles range between Rs 250- 450 (£1.30-£2.38). Try: Chicken, cheese, egg and vegetable noodles. Make sure you’re hungry! If you are travelling Sri Lanka on a budget or just prefer to eat with the locals, try this little rotti shop. Located under the Shana Hotel at the far Eastern end of Midigama, just past Secret Midi, this place serves the cheapest rice and curry buffet in Midigama. 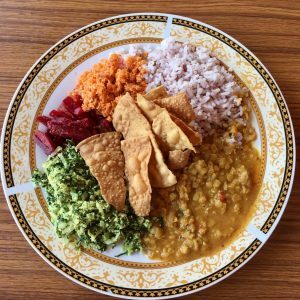 Every day you can help yourself to a different selection of vegetable curries, plus rice, popadoms and string hoppers for Rs 250 (£1.30). Don’t expect table cloths and fine dining, this place is rustic, but serves good local food. Prices are budget. Rice and curry is Rs 250 (£1.30), vegetable rotti Rs 50 (£0.25). Try: Rice and curry! The vegetable rottis are also really good but can be quite spicy. Although not technically in Midigama, this place deserves a special mention. Set on a cliff top with spectacular views across the ocean, Chef Akila Kitchen is one of the best places to eat in the local area. The menu is relatively small but each dish is done well. Its popularity is no secret so go early to avoid disappointment. A tuk tuk here from Midigama should cost no more than Rs 400 (£2.10). Prices are mid-range and up. Rice and curry is Rs 600 (£3.20), prawns in hot garlic sauce Rs 1,000 (£5.30). Try: Prawns in hot garlic sauce with rice. Insanely good. The rice and curry here is also superb. Surprisingly, many places in Sri Lanka do not have a licence to serve alcohol so it is not as widely available as you might expect. If alcohol is not on the menu, it is always worth asking as some (but not all) places will serve beer in cans or bottles if you are eating there. Alcohol is relatively expensive compared to food prices. The closest thing in Midigama to a fully stocked bar is Cheeky Monkey. During the day the vibe is surf chillout, with big cushions on the floor and low tables. You can enjoy a much larger selection of alcholic drinks than anywhere else in Midigama, including spririts, cocktails and even English cider (for a price). In the evening the vibe is livelier and on Wednesday night the spotlight searching the sky signifies to anyone within a 10 mile radius that Wednesday night is party night at Cheeky Monkey. Things really get going at around 10pm and the music gets louder as the night wears on. The party finishes anywhere between 4 and 5am. Great if you’re at the party, not so good if you’re staying close by and trying to sleep. Watching the sky come ablaze with cold beers on the beach is a really cool way to end a day packed with surfing. The nearest off-licence is in Weligama, located on the right hand side of the main street as you turn left from the coast road. A big (625ml) bottle of Lion beer will set you back about Rs 290 (£1.50), although they operate a bottle exchange so returning the empty bottle will reduce the cost of your next one to Rs 250 (£1.30). They also have the normal selection of wines and spirits, plus Arrack, Sri Lanka’s local spirit. Try it with coke and a wedge of lime over ice. Midigama is blessed with five good surf spots that work consistently, all within about 15 minutes walk of each other. 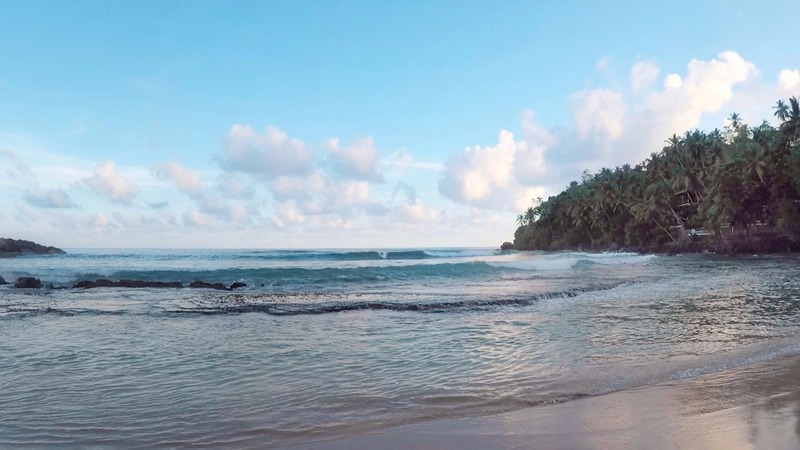 None of the spots are suitable for absolute beginners, Weligama is a better choice for learning to surf and is about 10 minutes away by tuk tuk. 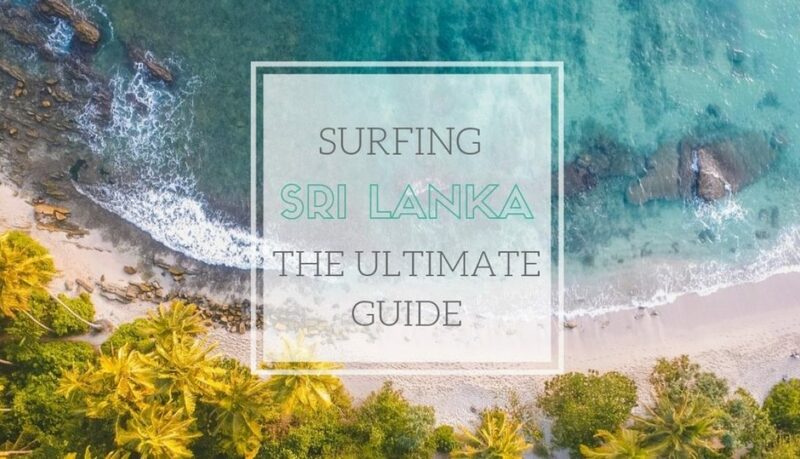 For a detailed guide, including a map of the spots, check out The Southwest Sri Lanka Surf Spot Guide. A powerful wave offering up fast rights and sometimes hollow lefts. This spot is usually less crowded than its neighbour, Plantations. Suitable for advanced intermediates and up. A deep sand bottom reef break, Plantations produces fun peeling rights and depending on the swell direction, a nice left. Suitable for advanced beginners and up. After a steep take-off, this popular A-frame provides short, fast lefts and barreling rights. Breaking over sharp, shallow reef, this spot is for advanced surfers only. Lazy Left, as the name suggests, produces long peeling lefts which mellow out after a steep take off. The waves break over deep reef making it a good introduction to reef surfing. Suitable for intermediates and up. Neighbouring Lazy Right offers mellow rights and lefts and on the right swell conditions can produce long rides all the way back to the beach. Suitable for advanced beginners and up. 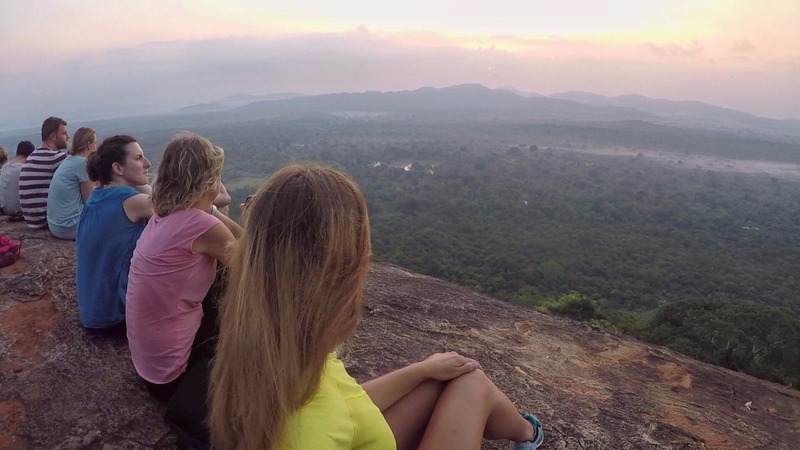 To the East, Weligama is widely regarded as the best place in Sri Lanka for learning to surf but more experienced surfers will also find something to get their stoke on. Mirissa is a good sheltered spot but can be crowded, also beware the urchins! To the West, ‘Sticks’ just beyond Ahangama is a really fun longboarding wave with a friendly atmosphere. Beyond that is Kabalana where a perfect A frame breaks just in front of the rock, though this spot is often overcrowded. Depending on the swell, the rest of the beach can be challenging with waves breaking heavily in pretty shallow water. 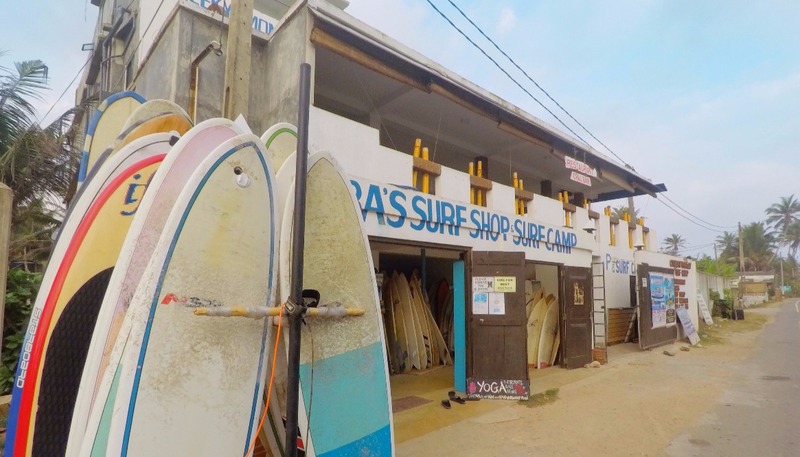 There are several options for renting a surfboard in Midigama. Starting at the clock tower at the Western end of Midigama and working East down the main coast road you have Midigama Surf shop, Chamara Surfboard Rental, Indika Surf Shop, and Baba’s Surf Shop. Each has a selection of short boards through to longboards and all are within about 10 minutes walk of each other so don’t be afraid to look around before committing. Expect prices in the region of Rs 300-400 (£1.55-£2.10) an hour or Rs 1,000-1,200 (£5.30-£6.35) a day. Definitely negotiate a lower price if you’re renting for a longer period. If you are unlucky enough to need a board repair service on your surf trip, I would recommend Indika, a small place located in the middle of Midigama. A minor ding repair should only set you back about Rs 1,500 (£8) and the quality of work is spot on. Scooters can be rented by the day from Baba’s Surf Shop in the middle of the village on the main road. The cost is approximately Rs 1000 per day (£5.30). Certain guesthouses also have scooters available for rent at a cheaper rate (eg Plantation Surf Inn, Danushka). 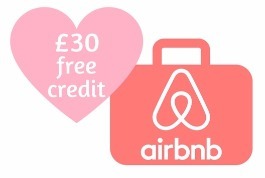 If your accommodation doesn’t rent them they will almost certainly be able to advise on where to get one. If you’d like to energise yourself for the day ahead or stretch out surf weary muscles in the evening, yoga classes are available at Baba’s Surf Shop at 8.30am in the garden, or 5.30pm on the rooftop. The cost is Rs 800 (£4.25) per class. There are also many other classes held in neighbouring Weligama and Ahangama, keep an eye out for fliers. Apart from Wednesdays, the nightlife in Midigama is pretty subdued and leans more towards eating than partying. See Where to Drink for more. 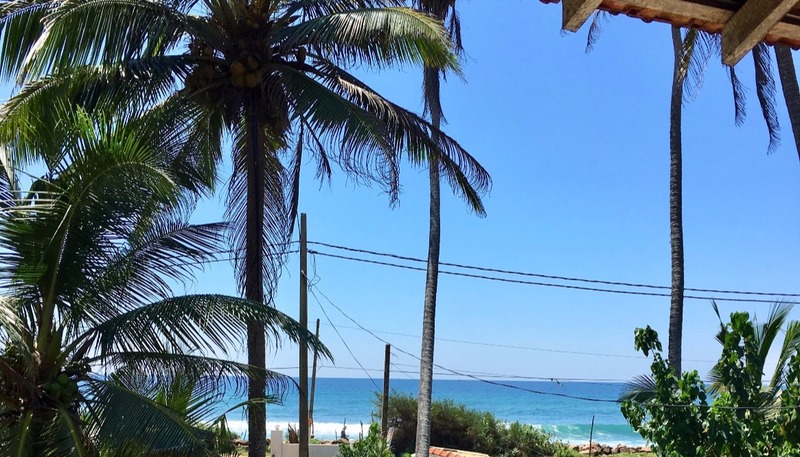 Outside of Midigama, the ‘go-to’ place to party is Mirissa where a string of bars and restaurants line the beach. Try Water Creatures on a Friday night; fireworks get the party started and you can sip cocktails on the beach or dance into the early hours of the morning. A tuk tuk to Mirissa should cost around Rs 600 (£3.20) from Midigama. The nearest supermarket is located in neighbouring Weligama, about a ten minute tuk tuk or bus ride away. I liked Food City which you can find by turning left off the coast road into Weligama, then at the crossroads turn right. It is about a five minute walk from there. The bus to Weligama should cost about Rs 20 (£0.10) each way, try to have the right money. A tuk tuk should cost no more than Rs 300 (£1.60) each way. There is no ATM in Midigama so you will need to head to Weligama for cash. I used HNB as it didn’t charge me any extra fees, though this will obviously depend on your card. 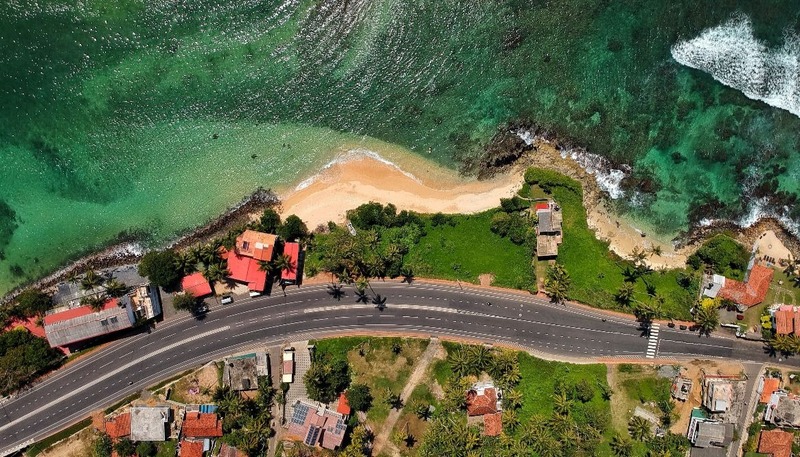 You can find this one by turning left off the coast road into Weligama, it is about half way down the street on the left. Other ATMs can be found by continuing down the same road, turning left at the crossroads and walking for about 5 minutes. Alternatively, ask a tuk tuk to take you to one. There are no streetlights in Midigama so if you are walking anywhere at night, you may like to bring a torch (or use your mobile phone). It’s no secret that surfers don’t like wearing reef shoes, but depending on your tolerance for risk/fashion consciousness, you may want to bring a pair. In theory you don’t need reef shoes to surf any of the spots in Midigama; most people don’t and I never did. That said, I did manage to slice my toe on the rock at Plantations, and I know of a guy who ripped a toe nail off! It sounds obvious but don’t leave valuables on the beach while you surf. 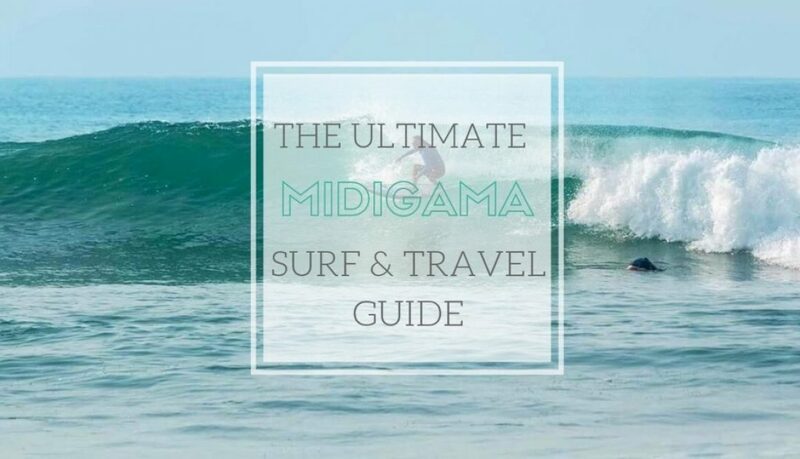 Have you surfed or travelled in Midigama and have any tips of your own? Share the love and pop them in the comments below. If there is anything else t you’d like to know, just add a comment and I’ll do my best to add it in. 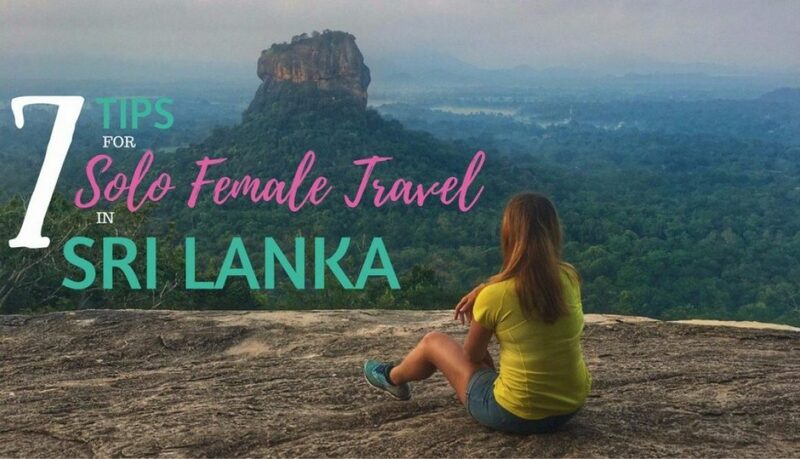 If you found this post helpful or know anyone who is planning a surf trip or holiday to Sri Lanka, please share it using the social links below.